Summer's the time for family reunions. We have one every year or two at our home in the country and a Scavenger Hunt is a big part of the family fun day. But this year I'm doing something quite different. I'm creating a race - The Amazing Egg Race (this is the working title, we may change it) - which features 8 genealogy related events. Hubs and I started brainstorming for this race about 3 months ago. Gradually it evolved into eight different events, each one based on an actual true event or life circumstance for one of my ancestors. 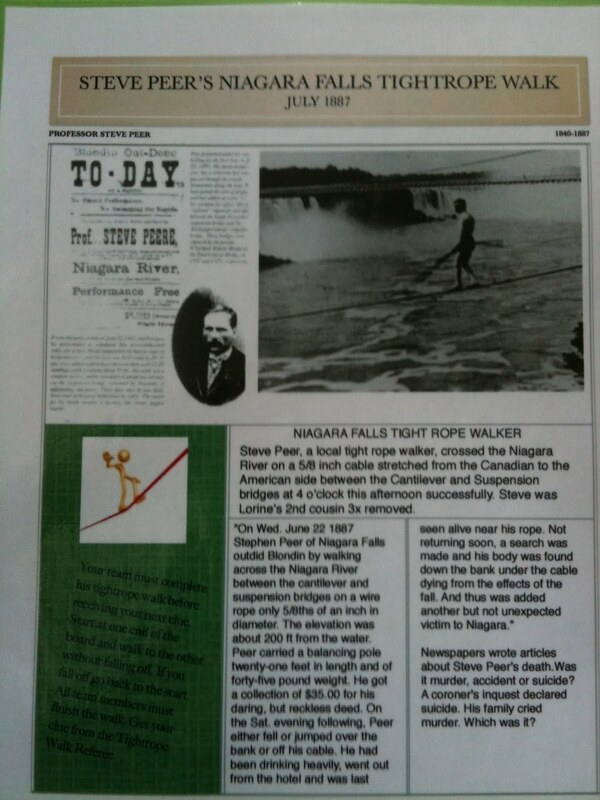 For example, one of my cousins, a man named Stephen Peer, walked a tightrope across Niagara Falls in 1887, then later fell to his death - whether accident, suicide or murder is not known. 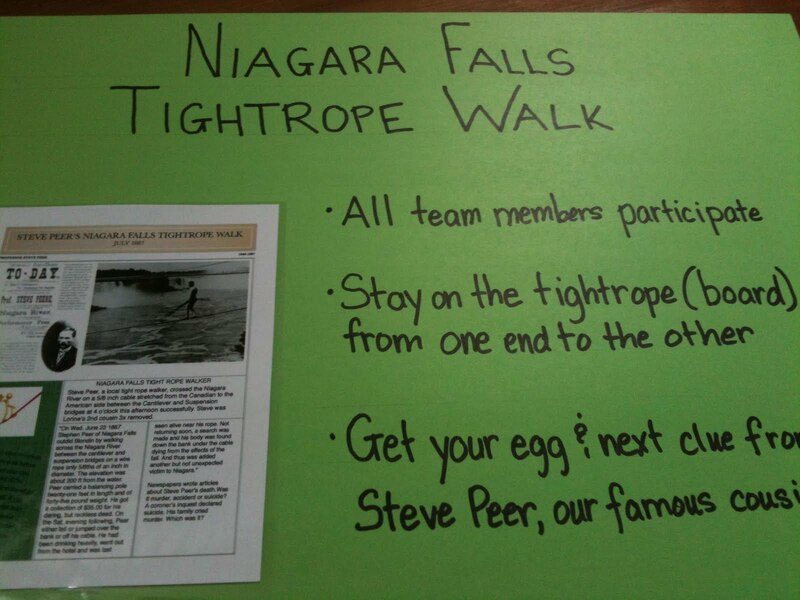 So one of the events that teams must complete is the "Steve Peer Niagara Falls Tightrope Walk". The event will consist of a long narrow board raised about 4 to 6 inches from the ground, along which all team members must walk from one end to the other. I don't want to give away too much information here in Olive Tree Genealogy blog, as some of my family actually read the blog! 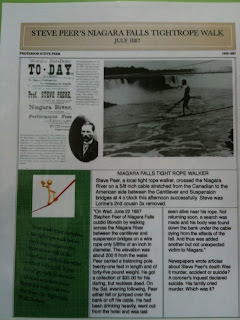 But I am creating posters on bristleboard and flyers for each event. The posters with rules and instructions for the specific event will be placed at the event location and laminated flyers taped to the poster. 8.5 x 11 inch Flyers provide details of the specific ancestor - their births and deaths, and accomplishment that the race event is based on. I've also added pictures to hopefully generate more interest. An event "referee" wearing a name tag with that ancestor's name, will monitor the specific event. As each team completes an event, the team is given a coloured plastic egg. Inside the egg is their next clue which takes them to the next event. Simple! But of course there are some surprises along the way. For instance, teams must reach the final ancestor pit stop with 9 coloured eggs and some other items which I can't mention here or it will give too much away. Let's just say that by the time teams reach one of the last events on the race, they'll be hard-pressed to figure out how they are going to complete it and manage to carry all their items and eggs to the finish line. In future parts of this series about Genealogy Games for Family Reunions, I'll explain how teams are assembled (Spoiler: Think Ancestor Cards...), more of the events, prizes, and how to plan and organize your own Genealogy Family Fun Day.